If you hate olives, you can stop reading and get back to work. If you're anything like me, however, just about anything as salty as an olive ranks up there on my favorites list. Which brings me to the glory that is a stuffed olive. I'm a big fan of olives stuffed with garlic, but olives stuffed with blue cheese are a close second. Which brings me to the glory that is a well-made dirty martini spiked with blue cheese olives. To be honest, I could take the olive juice with just a splash of vodka ... I realize how nasty that must sound to some of you, especially the olive haters, but you weren't supposed to be reading this anyway. I've had an excellent version at the Four Seasons and just the other night got to try Extra Virgin's tasty take on the drink, which arrives with a generous dish of six blue cheese stuffed olives. That's my kind of cocktail. Where do you think the best dirty martini in the area can be found? Are you pro olive stuffing? Try infusing the vodka with rosemary in the fridge for a few days before dressing it with a few large olives stuffed by your own loving hands with maytag blue cheese. Russia House pours a mean dirty martini, though I don't think the olives are stuffed. Amanda, go back to Tabaq Bistro - EXTREMELY Dirty Martini with Blue Cheese stuffed olives, you'll love it - Alyssa served it to me!! Awesome dirty martini at Tallula in Arlington -- called the Dirty Pete -- comes with all kinds of olves nad picked onion goodness -- plus a stuffed treat at the end. I found some really good stuffed olives a couple of weeks ago while searching online. The name of the brand is Primos...they are from CA somewhere. 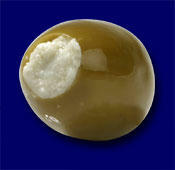 Anyways..I purchased their blue-cheese and garlic stuffed olives from the site www.madeincalifornia.net. You gotta try them! The olive lovers are representing! Soussi on 18th Street serves a mean dirty martini. I think it's called Jamal's Filthy Martini, after Soussi's owner (and owner of Utopia). 3 stars! I love your note about blue cheese stuffed olives. This is a note from your neighbor Matt. I am taking a client out for dinner tonight. He requested "something funky with good wine." Do you have any recommendations?